The school uniform has been supported by parents/guardians, students and staff as a means of creating a distinct school identity. 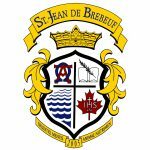 Students who enroll at St. Jean de Brebeuf C.H.S. do so with a full awareness of the uniform expectation and implicitly agree to abide by the uniform dress code. Students are expected to be in full and proper uniform at all times throughout the instructional day (8:20 a.m. to 2:20 p.m.) including the lunch periods and if attending school programs before or after school (i.e. library, detention, Help Lab etc.) 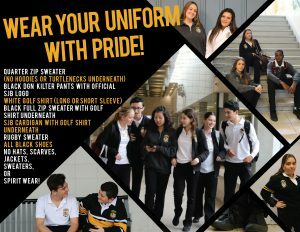 Students with a Study Hall or in the Co-operative Education Program must also be in full and proper uniform throughout the instructional day. Students are also required to be in full and proper uniform during school field trips unless arrangements have been previously made with administration. Please note if you require any uniform items, DGN Kilters will service our school with a “Mobile Tuck Truck” every two weeks. The mobile truck will park on our school property and will be available from 11:00-4:00 p.m. External accessories not in keeping with the spirit of the uniform code are not acceptable.